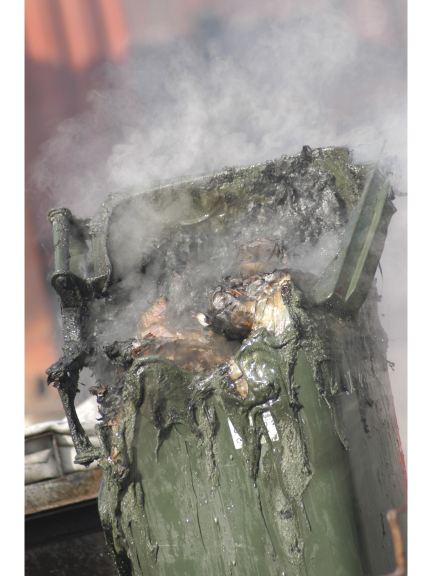 Over the last two weeks residential areas within Wells, Somerset has had a spate of wheelie bin and rubbish fires. Most of these have occurred within the early hours. Devon & Somerset Fire & Rescue Service remind everyone that arson is a serious crime and anyone convicted faces a length prison sentence and a significant fine. Furthermore, it comes with a financial impact as each time the fire service is called out it results in a significant cost to the taxpayer. Chris Grantham, Watch Manager for Wells Fire Station said: “We have some simple tips which we urge residents to follow to deter arsonists and help people stay safe in their homes. Put your wheelie bin or black bags out on the day of collection and then your bin should be brought back in as soon as possible. Your wheelie bin or black bags should be kept in a secure place. If you are throwing out old furniture or other household items call your Council to arrange a collection and keep them in a secure area until the collection takes place. If you are using a skip for building work or rubbish removal, try to fill it and remove it on the same day. If not, ask the skip hire company for a skip with a lockable lid and position the skip at least six metres from your home. Never put hot ash in your wheelie bin. If anyone has any information about fires no matter how big or small please telephone crimestoppers on 0800 555111 where they can give details completely anonymously. Alternatively, call the Police non-emergency number 101. For more information on how to prevent Arson visit our website. To request a Home Fire Safety Check call free on: 0800 0502999. For any other fire safety advice, contact the Devon & Somerset Fire & Rescue helpline on: 01392 872288 or visit our website.